Running a Facebook page can be a great way to push a brand’s visibility and promote products. However, simply posting content on Facebook will not bring the desired results. The network’s algorithm has the upper hand on what followers see in their News Feed. But, you don’t have to be a mastermind to boost the organic reach of your Facebook page. 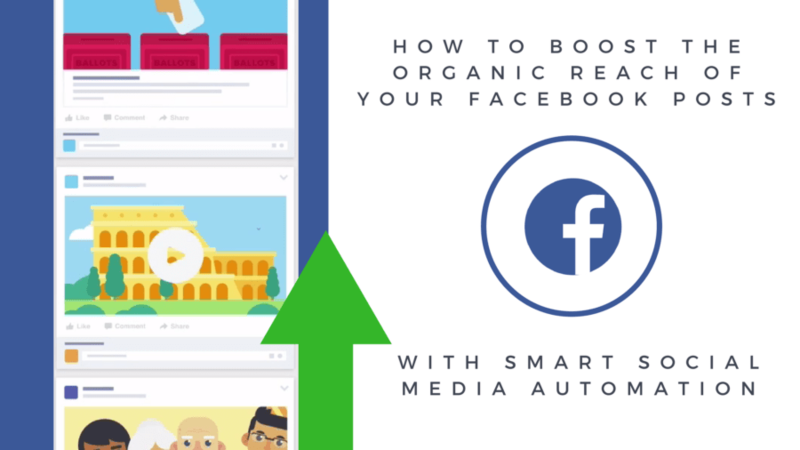 We have gathered 4 basic steps on how to boost the organic reach of your Facebook posts for you. The algorithm behind Facebook’s News Feed is complex. Ever since 2006, marketers and publishers have been pulling out their hair just to show up in their follower’s News Feeds. Facebook’s algorithm ranks a post according to various aspects to decide whether or not it is interesting for a particular user. Posts from friends and family or those, that have been commented, liked or shared by them, will therefore show up higher in a user's News Feed. However, there are actually a few things you can do to leverage the visibility and boost the organic reach of your posts. 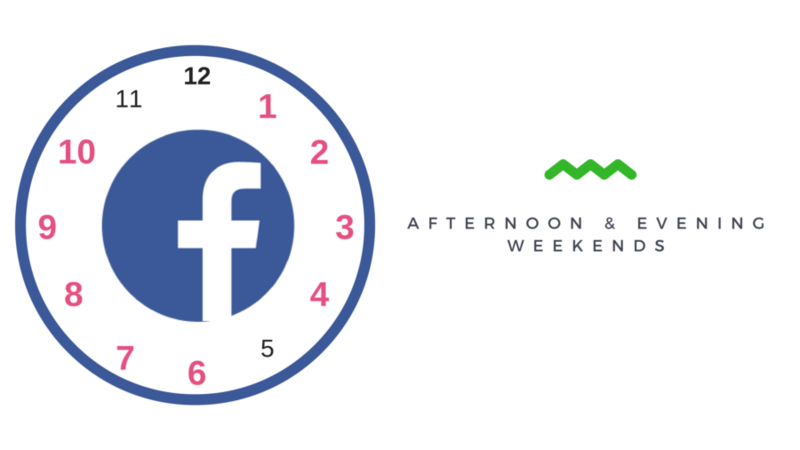 The best times for Facebook postings are in the afternoon from 1 p.m. – 4 p.m. and in the evening from 6 p.m. – 10 p.m., as well as on weekends. Posting during network rush hours will improve your chances to evoke more interactions. You can find out your own individual best times, using the Facebook Business Manager analytics. These statistics can show you, at what times your posts generate the greatest reach among your unique followership. Our Facebook posts, for example, reach the biggest share of our followers around 8 am and then again around 6 o’clock in the evening. 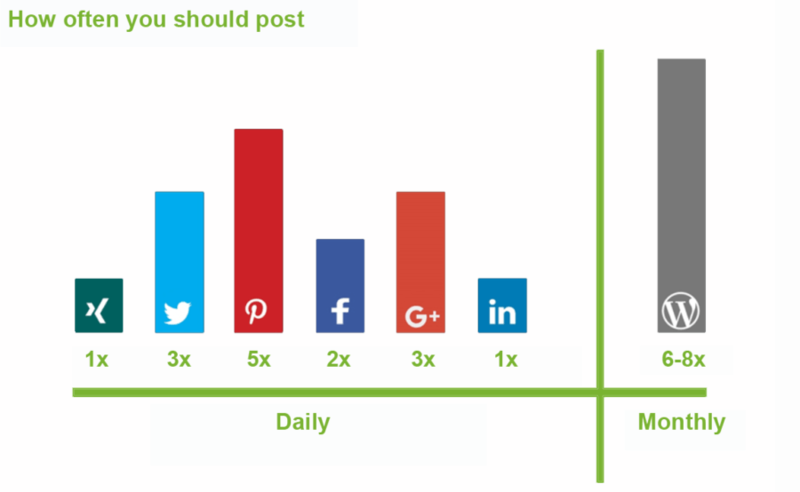 By knowing when your followers are likely to be active, you can post at the right times for maximum engagement. The more likes, shares and comments your post gets, the greater will be it’s visibility. Each new interaction will push your post to the top of the News Feed again. In order to catch the attention of followers who missed your original post, it might also be a good idea to post your content more than once. But be careful with re-posting. Every network has unwritten rules of how often to post and re-post. Whereas you might share your post on Twitter as much as 4 times a day, doing the same on Facebook might annoy your fans. However, if you have a personal profile and a business page or a brand or product page, you can share your post on both channels, but choose a different time for each post. You might also share your post to suitable Facebook groups. 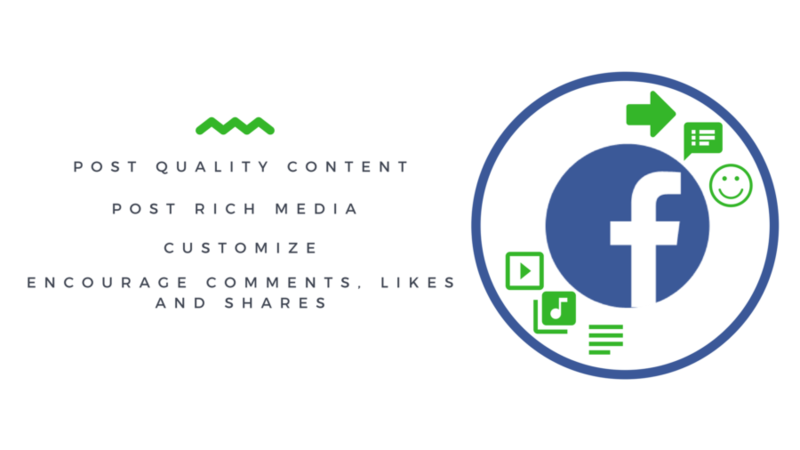 And you can repost your evergreen content every 2-3 month on your page and profile. Writing valuable content and engaging with the community will already take up a lot of your time. Keeping up with all these tasks for your daily social media management, your workload simply might not leave the time to promote, share and repost content at the best times. 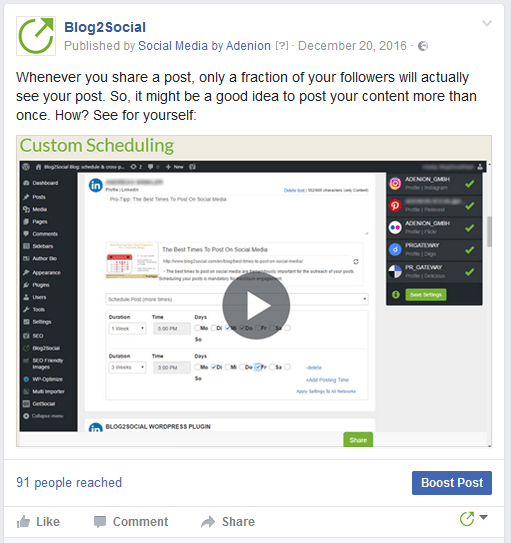 Social media automation tools can help you to schedule and share your content automatically. I will come back to this a little later. Is the company’s page profile complete or is information missing? Have users already hidden content from this page and thus indicated low quality? Does the pages have followers who also follow established, high quality content providers? Additionally, Facebook’s algorithm keeps an eye on how long a user reads an article you’ve shared. If the content on your website turns out to be irrelevant, readers will return to their News Feed within a couple of seconds. Facebook therefore assumes your content might not interest the particular user and will rank your posts a little lower in the News Feed. Clickbaits and triggering headlines that simply seek to gain page views but do not contain the expected information, will therefore work out to be counterproductive to your actual goal. Moreover, Facebook is monitoring the click to engagement ratio of a post. Even if you want your followers to click the link, try to evoke engagement like comments, shares or likes as the algorithm takes this as an indicator for quality content. No matter how any algorithm works, only valuable and relevant content will build up a loyal followership over time. However, not only the content itself, but also the format of your post can make a difference. The social networks provide specific features and options to present and promote your posts. And communities react very differently to specific posting formats on different social platforms. While #hashtags and @handels are a MUST on Instagram and Twitter, they don’t trigger interaction on Facebook. Customizing your postings for Facebook is worth the effort, in order to address your communities in a way that works best on each social platform. Tip: Take your follower's interests into account when posting to Facebook, address and engage them to stay on the top of their News Feed. Thus, if you use automation tools for cross-posting your content, make sure they allow you to customize your posts. In the next section, I will show you how we customized our postings to achieve 25 times higher interaction rates, with just a simple trick. Facebook evolved from a student’s message board into a professional communication network. However, users still want to be entertained and visual contents turn out to be most entertaining and thus, trigger more engagement. The network takes this aspect into consideration when figuring out which posts will appear higher in the user’s News Feed. However, not all of them are equally ranked by Facebook’s algorithm. Rich media content such as videos, images and infographics will generally generate better rankings. In fact, videos are currently the most engaging media formats on Facebook and generate up to 135% more reach than images. The posting format of videos on Facebook focuses strongly on the visual content. Your video will automatically be played as your followers scroll down their News Feed. Naturally, this triggers views. Video-posts therefore reach far more visibility than any other posting format on the network. Additionally, you can address your audience with an individual comment or place the original link in the teaser-text. Thus, if you would like your reach to go through the roof, it’s time to start planning your next video shoot. Not only videos, but also other kinds of visual content can help you to boost your Facebook reach. In fact, images or infographics are a great alternative to videos as they are faster and cheaper to create, but, nevertheless generate high visibility. When you upload an image in your Facebook status update, the post will focus on the visual content, triggering your followers to click. You can add an individual comment or even paste your website’s link in the status update. This way you are keeping your followers on the Facebook News Feed and encourage them to share, like or comment your posts. However, the link in the comment of your post will still bring visitors to your site. So, if you aim to encourage followers to interact with your post, posting a picture instead of a link post could be the right solution for you. If you insert a link in your Facebook status update, the network will automatically generate a link preview, showing the social metadata of the page you are linking to, such as image and teaser text from the URL. This way the post focusses on the link. A user who clicks on your post will be forwarded to the content on the website, the link is pointing to. This way you lure readers to your website, generate clicks and might even convert some of your followers into leads. However, our subsequent research will show, that the algorithm does indeed favor media-posts over links in the News Feed ranking. It all depends on your strategy. If you are seeking to gain page views for your blog, a link-post is the right choice for you. However, if you would like your Facebook posts to reach more users, you should post images. 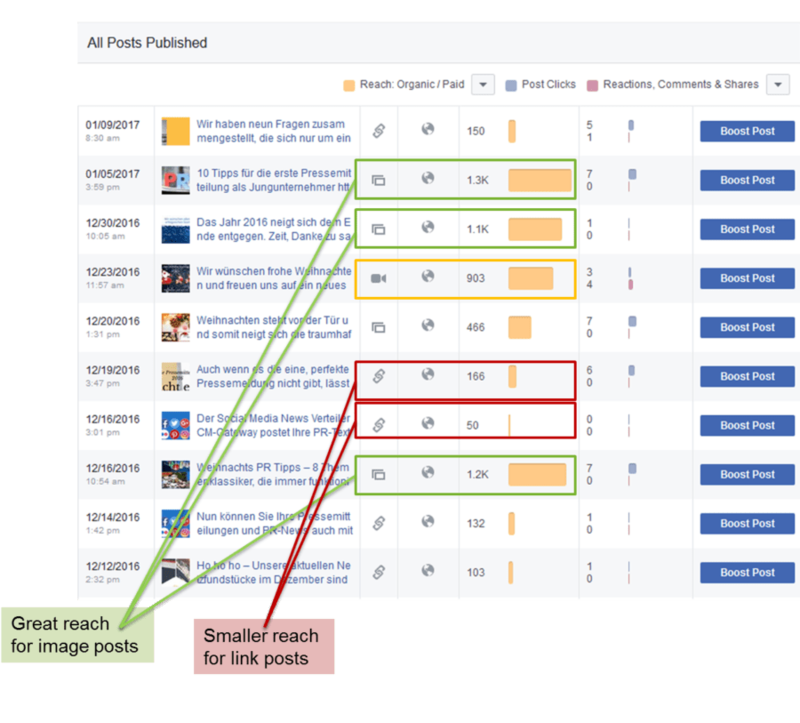 Which posting format will boost the organic reach of your Facebook posts? 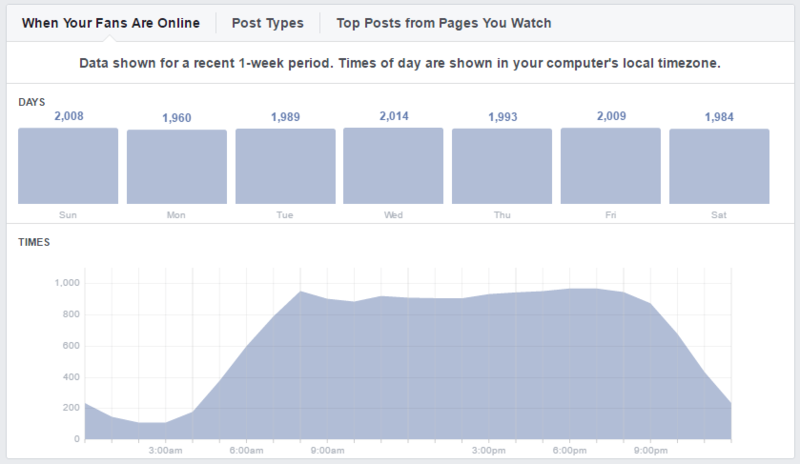 We have done some intensive testing for you and monitored the reach of our own Facebook posts. During a period of two month we posted content to our Facebook page using these three different formats. By turns, we posted focusing on the link or the image, always keeping in mind our individual best times. What we found out was interesting. Contrary to popular beliefs, posts focussing on images performed much better in our test than posts focussing on links. In fact, image-posts even reached up to 1000 impressions more than posts we’ve shared focussing on the link. Our Facebook analytics show, that image-posts generate a much better click to impressions ratio than any of the other posting formats. These Interactions could boost their permanent visibility on our followers News Feeds. Automatically generated preview links only reach 10% of the total followers in comparison to images-posts focussing on the image. Videos and images both lead to interactions on the network, whereas links drive users and traffic to external pages. Last year's new developments such as live streaming or instant articles seem to be based on the aim to keep users on the network’s own platform. Finally, you will have to find out for yourself, what works best for your unique audience. Some target groups might prefer, if they get to a target website or blog as soon as they click on your posts. Others might prefer to stay on their News Feed and see an image in the Facebook preview. Make sure to take the time to monitor the reach of your posts. And, if in doubt, run some tests yourself. To ensure valid testing results not impacted by any disruptive factors, we strictly followed the same procedure for each posting. Thus, we posted the same blog post at the exact same time on different days, once as ”link-post” and once as “image-post”. Through this direct comparison of the different posting formats, we could attest a bigger organic reach generated by image posts. However, this again could just be a coincidence. To eliminate any possible disruptive factors in our test, we ran another testing and compared the organic reach generated by exactly the same “image-post”, posted at the same time on different days. We found that, no matter on which weekday we posted on Facebook, images posts would constantly generate a much better organic reach. Considering all these aspects, the ideal posting format can be quite heavy on your workload. However a better Facebook reach is worth the effort! 93% of businesses worldwide are using the platform to promote products or services. 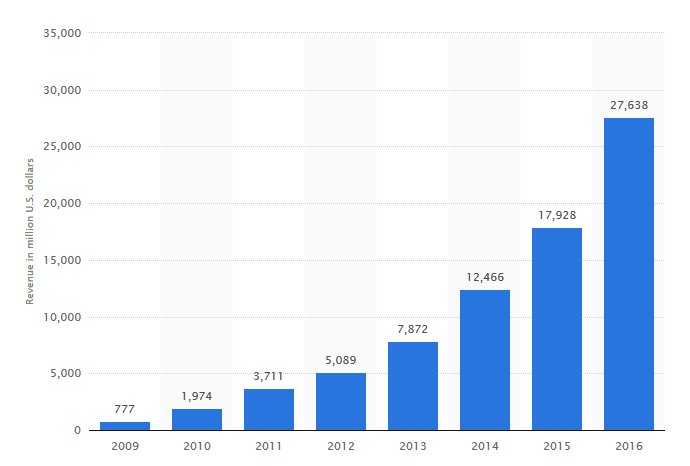 With 1.7 billion active users, you can reach almost one third of the world’s population through Facebook. Social media automation might help. There are several tools and plugins that can reduce your workload. But, keeping in mind what we just learned about the Facebook algorithm, simply pushing out the same message in the same format across your channels, will not get the best results. So, when setting up your automation strategy and choosing the right tools, make sure they provide options for customizing your posts. We use the Social Media Automation Tool Blog2Social for cross-posting and scheduling our blog posts on social media. The plugin allows us to cross-post to all our social media channels, but at the same time provides many options to customize our posts, select various posting formats and to schedule our posts for the best times to post on each network. This way we save a whole lot of time for cross-promoting our posts. For Facebook the plugin allows to post link-posts as well as image-posts. In the context of beating Facebook’s algorithm, this custom-formatting feature of Blog2Social might actually be the most effective. With this feature, you can individually select your preferred posting format for Facebook, either as link-post, focussing on the link or as image-post, focussing the image. Furthermore, the WordPress plugin allows you to connect multiple Facebook profiles and pages to automatically cross-posts your content to the network. You can schedule your posts with pre-defined “best times” to post during Facebook’s most active time slots. This way you increase the likelihood to appear in your follower’s feeds, when they are online. Alternatively, if you know which times work best for you, you can also select your individual times and schedule your posts along your custom time settings. This might be of special interest, if you promote your products or brand internationally and across various time zones. 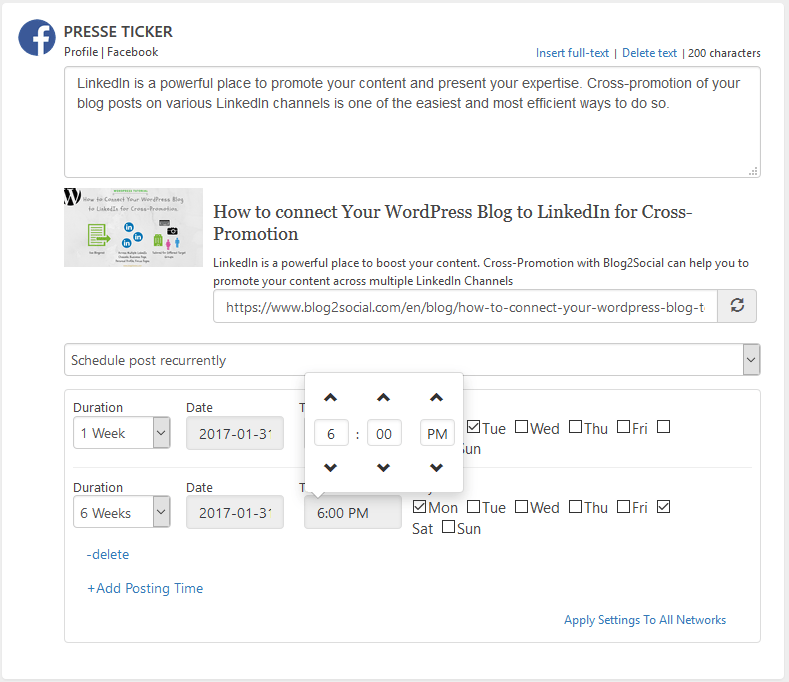 For even more customizing options, Blog2Social provides you with a one page preview editor displaying the postings for all of your selected networks. The plugin automatically turns your blog post into an adapted format for each network, with pre-filled teasers for your postings. In a one step-workflow you can easily edit these texts and add a personal touch. Addressing your followership with personal comments will encourage more likes, shares and comments and push your post to the top of your Followers News Feed again and again. 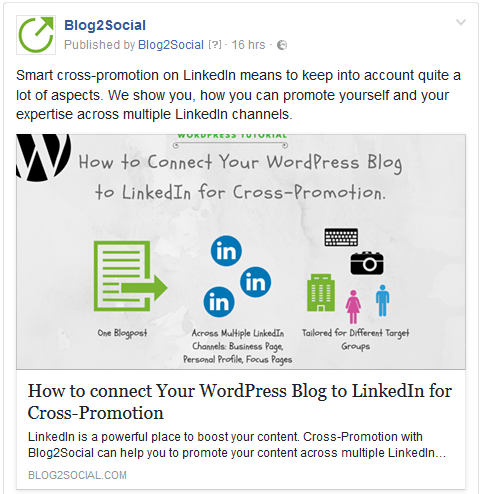 However, beating Facebook’s algorithm, the custom-formatting feature of Blog2Social might actually be the most effective in this context. With this feature, you can individually select your preferred posting format for Facebook, either as link-post, focussing on the link or as image-post, focussing the image. Summing up, you have to meet four main challenges when trying to boost the visibility of your corporate posts. After we looked at what the Facebook algorithm favors to show on your followers News Feed, you may actually let the algorithm work for you, if you do it right. By knowing which kind of headlines, content, media and posting formats Facebook favors, you can actively avoid common mistakes and build a successful Facebook marketing strategy that will leverage your reach and lure readers to your blog. Always keep in mind: Monitor your Facebook performance constantly and test different kinds of content and visual media, to find out what your followers like best. 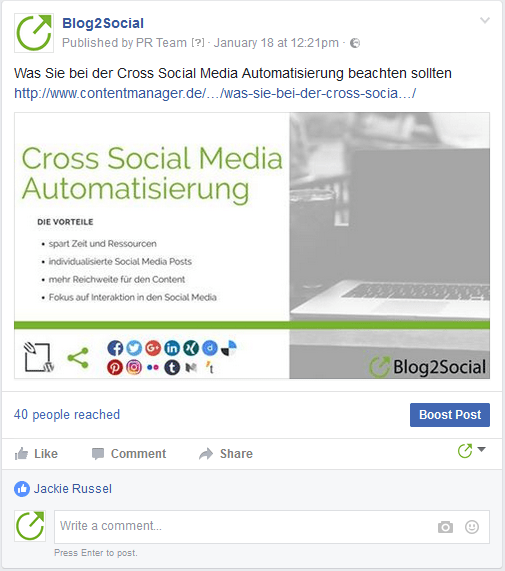 Social media automation tools help you to save time on cross-promoting and scheduling, but always keep in mind they provide you with the right format to customize your posts to make sure you score a high rank in Facebook’s News Feed.